In the first quotation in this chapter, to support his claim that it is heretical to doubt any statement of Chazal, R. Schmeltzer cites Rambam’s description of a makhchish maggideha as a heretic. But Rambam explicitly defines makhchish maggideha as “someone similar to Tzaddok and Baytus,” who Rambam explains denied the very concept of an Oral Torah (Perush haMishnayos, Sanhedrin 11:3). He certainly did not intend it to refer to someone who denies any statement of Chazal, as he would then have been defining himself as a heretic! In a footnote, R. Schmeltzer attempts to deal with this obvious problem by citing Rav Moshe Cordovero’s position that since the sefiros are part of Torah SheBe’al Peh, the status of makhchish maggideha also applies to one who denies sefiros, and by extension, any part of Torah SheBe’al Peh. But this is Rav Moshe Cordovero’s extension of Rambam’s position; it is not Rambam’s position! One can choose to adopt the position that it is heretical to doubt any of the words of Chazal whatsoever, but one cannot draft Rambam in support of this. You might not like RMK, but Shmeltzer is representing RMK and by extension the Rmbm correctly. IIRC Shmeltzer explains the contradiction between the Moreh and everything else from the Rmbm is a chapter devoted to just that. Would this not include the Karoim? Is it limited to T&B, what about the enlightenment? T&B in their days denied the active mesora, and that the Rmbm's point. Judging from this post I'm guessing there is much more in the sefer you don't like, but can't find the sources to back it up. He is representing RMK correctly, but not Rambam. You can't say that Rambam's definition of MM includes himself! Yes, I'll be getting to that chapter. For now, it should be noted that there is no contradiction here between the Moreh and the Yad on this topic! Is it limited to T&B, what about the enlightenment? It would include things similar to T&B, one can argue about what is similar. But it would definitely NOT include scientific errors, since Rambam himself does this! Richard, why would you judge from this post alone? I have many, many more posts planned for this book. Wait and see! why have you ignored my points? "In a footnote, R. Schmeltzer attempts to deal with this obvious problem by citing Rav Moshe Cordovero’s position that since the sefiros are part of Torah SheBe’al Peh, the status of makhchish maggideha also applies to one who denies sefiros, and by extension, any part of Torah SheBe’al Peh. But this is Rav Moshe Cordovero’s extension of Rambam’s position; it is not Rambam’s position!" Ironically, at the other end of the spectrum - the charge might be leveled that those who DO maintain the doctrine of sefiros are ovdei a"z.
so you know the rmbm didnt beieve in sefiros? Nice post. I hope all is well by you, there was some talk on hirhurim.blogspot.com concering your mental health, I'm with all your projects, and the constant pressure from the kanoim, it must very straining, don't forget your health is more important, in the long run klal yisroel will straighten out. Heshem will never forsake his nation, and we need you here when it happens. I predict there will be an almost magical turnaround, and then we will call on you to be our leader. Stay strong, be healthy, and love your family. So why are you blaming Shmeltzer? 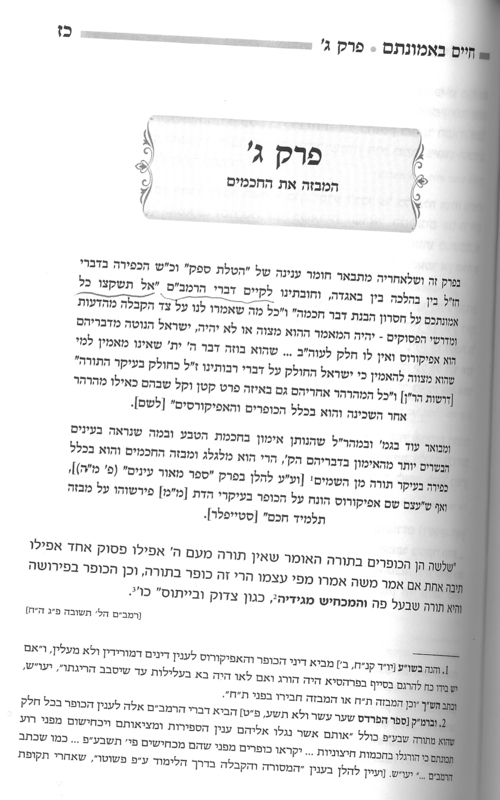 1) The page quotes the Stiepler about "mevaza talmidie chachamim". Where is this Stiepler, and what exactly is he talking about? 2) Someone recently showed me a copy of the Chazon Ish( Rosh Hashanah 138:4 ?) who states that the position of the Eitim L'binah who states that Chazal used knowledge of their times for a certain calculation(molad ?) is "divrei minus". The Chazon Ish further states that although the Eitim L'binah was a "y'rei elokim", he nevertheless mistakenly thought it was permissible to write his opinion; furthermore, the Chazon Ish writes there is a big "yezter horah" to say such an opinion ! The point is that the Chazon Ish cited by R. Aharon Feldman may be about Aggadah, but to say Chazal erred in Science, while "minus" according to the Chazon Ish, is not as stringent as the quote from Iggros Chazon Ish about Aggados. 3) I once came across an article in a Torah Journal circa 1960( I don't have access to it now and recall all the specifics), in which a Rav quoted RSRH's statement on Aggados in the preface to Horeb. Unlike R. Elias in Nineteen Letters who, IIRC, seems to harmonize the Horeb quote with R. Hirsch's letter to R. Wechsler(like R. Dessler on R. Shmuel Hanagid? ), this author understood Horeb to mean that Aggados are not binding. This Rav called it, "the one unfortunate statement in the great legacy of RSRH", but did not call it kefirah. See also R. Leo Levi's original "Vistas from Mt. Moriah", which IIRC, understands R. Shmuel Hangid(and Horeb) not like R. Dessler. Perhaps his position has since changed. You, admittedly, know nothing about sefiros, so how can you assume the rambam didn't believe in sefiros? "point," I don't know enough about RYBS to comment. Chaim, R. Schmeltzer takes it even further than RMK, applying makchish maggideha to something that Rambam himself denied! "don't forget your health is more important, in the long run klal yisroel will straighten out." I've been meaning for a while to say that as well. Hatzlacha rabbah to R. Slifkin and his family, and it should be m'kuyam "samcheinu k'ymos einisanu". Charlie Wolf - thank you for your kind words. Jet-lag aside, baruch Hashem I am fine. Allegations about my mental health remind me of the reaction in Bnei Brak to Rav Gedalyah Nadel's acceptance of science; they claimed that he lost it after his wife died. By claiming lack of mental health on his part, they thereby saw themselves as absolving the need to actually deal with what he said. Likewise those who claim that I have a vendetta against R. Schmeltzer; whereas I did take personal offense against the actions of certain people in the campaign against me, R. Schmeltzer was not one of them. I find it hard to have a personal vendetta against someone that I have never met. But by claiming that I have such a vendetta, people see themselves as having absolved themselves of the need to actually deal with my pointing out the appalling distortion of sources in his work. "Photographer," this has nothing to do with sefiros. We can debate that another time. It has to do with a category of statements in the Gemara that Rambam himself says are not valid. It appears that there is also a very big Yetzer Hara to claim Mesora all the way back to HaSinai for what was deduced later, and/or understood from "external" sources, such as measurement (of times between lunar eclipses in the above case). "R. Schmeltzer explains that the chapter will deal with how doubting any of the words of Chazal, whether in halachah or Aggadah." Alex, you are over-analyzing this! Makhish Magideha' with the implication of Kordevaro are to be understood as follows. The was a time in the History of Judaism where the non-acceptance of the Saferot system was acceptable. A well known example that comes to mind; The responsa of the Rivash. Certainly in that period it was not considered heretical to discard the Saferot system, however, just a few short years later, when such a view became almost universally accepted a Masoric, a teaching of the Baalei Mesorah - Magideha'. So too in the time of the Rambam, considering the validity of Scientific statements, in contra to Talmudic opinion, was an option, and a position accepted by some of the Jaonim, thereby this Masora was not closed. In latter generations, as the universality of talmudic supremacy, became a parcel of tradition, it can now fall under the dictum of Makhish Magedeha'. -the more you teacher, the more you learn. Student/teacher - I am fine with the idea of the definition of heresy changing. However, you cannot invoke the Rambam as the authority for this definition, when you are using it in a way that would include the Rambam in this definition! The definition of heresy posed by student/teacher is based on the belief that the truth will not depart from Am Yisrael. That is a nice position, but a self-defeating one. Most of Am Yisrael have become heretics by choice. Heretics according to the definition of student/teacher, that is. I contend that this heresy is fueled by the truth. Mi K'Amcha Yisrael. Every religious ban of the truth increases the opposition. Until the redemption of the truth. Would this sefer have been more accurate had it said: "according to Rav Moshe Cordovero’s u nderstanding of the Rambam"? "Student/teacher - I am fine with the idea of the definition of heresy changing. However, you cannot invoke the Rambam as the authority for this definition, when you are using it in a way that would include the Rambam in this definition!" Why not? If the definition of things are changing, and it's acceptable for definitions to change, then why can't the Rambam's own words damn him? If the definition of what is heretical can change, then also the definition of "the very concept of an Oral Torah " can change. That is, if we now define the very concept of the Oral Torah to include "all the words of Chazal where from Moshe" then it's very much the case that the Rambam damned himself. Rambam very well might have said, "if this is your oral torah, then I deny it!" Now if the definitions can't change, that is a different story. It would have been less false, but still false. RMK does not mention concepts that Rambam himself was aware of and explicitly deemed false. If Rambam would have said, "Whatever is ever in the future accepted by many people as part of the Oral Torah, then whoever has ever denied this in the past is a heretic," then he would have damned himself. But he never said any such thing, and nor would he have; only a fool would say that. You can say that you are expanding Rambam's definition of makchich magideha. But you can't say that, on Rambam's authority, Rambam's approach to Chazal is makchich magideha! I understand you to be saying that the RMK's interpretation of the RMBM makes no sense, IF we are to understand him to be saying that one who disagrees with any word of the Chazal is a heretic; the RMK's understanding of the RMBM would damn the RMBM, something the RMBM clearly did not intend. Do you believe that Rabbi Schmeltzer has a mistaken understanding of the RMK, or that Rabbi Schmeltzer's understanding is correct, but that RMK makes no sense? What is your understanding of the RMK, and how do you believe the RMK arrived at the conclusion (based on the RMBM) that one who denies the sefiros is a min? In other words, I'm questioning your statement that "One can choose to adopt the position that it is heretical to doubt any of the words of Chazal whatsoever, but one cannot draft Rambam in support of this." It seems to me that the RMK is doing so AT LEAST with regard to belief in Sefirot. 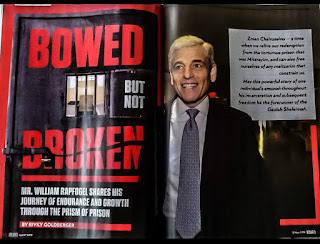 >>"You can say that you are expanding Rambam's definition of makchich magideha. But you can't say that, on Rambam's authority, Rambam's approach to Chazal is makchich magideha!" I believe you are looking at this through an academic lens of "the historical Rambam". But this book/camp is presumably "ahistorical". This means the Mishna Torah is now an independent text which bestows authority to any valid interpretation. And they believe its valid interpretation is not qualified by the Rambam's own approach to Chazal. This is partly why it is meaningless for you to critique this book. You are judging it by your own standards of truth and integrity and are not taking their view into consideration. >>"Likewise those who claim that I have a vendetta against R. Schmeltzer; whereas I did take personal offense against the actions of certain people in the campaign against me, R. Schmeltzer was not one of them. I find it hard to have a personal vendetta against someone that I have never met." Why one one have met someone before having a personal vendetta? If he was partially responsible for illegitimately ending your teaching career within the chareidi educational system, why wouldn't that be reason enough to have something against him? Not quite. RMK only extends Rambam's category to something that Rambam does not directly discuss (though it does appear to many people that Rambam would have denied sefiros too). R. Schmeltzer makes it much worse by even applying it to things in the Gemara that Rambam himself rejected. the Mishna Torah is now an independent text which bestows authority to any valid interpretation. And they believe its valid interpretation is not qualified by the Rambam's own approach to Chazal. If R. Schmeltzer would come out straight and say "we disagree with Rambam's own approach to Chazal," I could accept that. But he makes out as though this WAS Rambam's own approach to Chazal, as well as everyone else in the history of the Jewish People. What can I say, I just can't summon any antipathy towards him, he was too obscure a figure to me in all this. I feel disdain, not personal animosity. There were other people involved, that I knew personally and who attacked me personally and that I felt personal animosity towards, but not him. I think a distinction needs to be made between the Rambam who was a person that existed in history, and the Rambam which is the collected works of said person, and is just a text, open to new understandings as all texts are. For example. The founding documents of the USA state "All men are created equal." However, we know that not all men were equal under the law. Namely blacks and non-land owners. However, later in history we said that "all men are created equal" is a basis of the founding of our country, and therefore blacks and non-land owners should be equal. We used the text to damn itself, or at least to damn Jefferson who many now say was not such a great believer in freedom and equality because he owned slaves! There is the text, and then there is the historical personalities which were authors of those texts, and the two should not be confused. This is all being said under the assumption that you believe your statement that definitions of heresy can change over time. "he would then have been defining himself as a heretic!" "You can't say that Rambam's definition of MM includes himself!" " 11/19/2008 This lecture will explore the commentary of the ibn Ezra on a number of these verses and will examine two super commentaries on the ibn Ezra that attempt to reconcile the ibn Ezra's commentary with the traditional view of Moshe's authorship of the Torah." Oh, and it's about the 14-15 minute mark. "It may be an ecclesiastical privilege to burrow for heresy among the obscurities of thought, and the ambiguities of language, but in the charity which thinketh no evil, we are bound to believe that our neighbor (Newton) is not a heretic till the charge against him has been distinctly proved." From the post: "The theory of the music of the spheres is connected with the theory of the motion of the stars in a fixed sphere, and our Sages have, in this astronomical question, abandoned their own theory in favor of the theory of others. " "Reaching for the Stars to Create Music of the Universe"